What are the benefits of rainscreen cladding? With an increased choice of materials, finishes and hanging systems available to architects and building designers, rainscreen cladding panels are now more popular than ever. As a result rainscreen is now commonly specified on most major developments. It also helps that installers find fitting of modern rainscreen cladding panels relatively straight forward – they are lightweight and easy to handle. Plus, the fact that they are manufactured off-site to exacting tolerances means that they fit right, first time. Architects and specifiers often prefer rainscreen facades, too, because they have high aesthetic appeal, creating a building envelope that stays looking good and performing over the long term. Modern rainscreen cladding can be used on a wide range of developments including high-rise or low-rise, new build or refurbishments. When used on refurbishment projects, the ability to over clad an existing building means that it looks and performs like new. 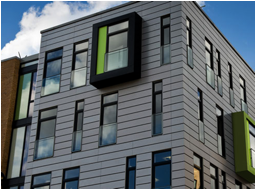 In fact, rainscreen cladding panels are one of the most cost effective methods of bringing an existing building up to modern thermal performance standards. For example, it is possible to fix slab insulation to the exterior of a building and then over clad it using our rainscreen panels. Another consideration worth bearing in mind is that refurbishing an existing building results in a much lower carbon footprint compared to demolition and new building. With the primary role of protecting the exterior of a new or refurbished building from the elements, rainscreen cladding works on the principal of a rear ventilated cavity. When the cladding panels are installed, the aluminium hanging system creates a small gap between the panel itself and the exterior of the building. This gap, or rear ventilated cavity, allows air to flow up behind the panels, preventing moisture from reaching the main building structure. As a result, any small amounts of rainwater that passes through the joints in the cladding panels is expelled to the outside. As a specialist supplier of rainscreen cladding systems we are continually developing new ranges that provide specifiers and installers with more choices. That is why we now offer a wide range of Aluminium Composite Materials (ACM), which can be manufactured in Vitrabond, Reynobond, AlucoBon and Larson®. The principal benefit of Aluminium Composite Materials (ACM) is its lightweight yet strong nature, which makes it highly suitable for most elements of a building envelope. These unique structural properties – flexibility, durability and low maintenance – means that it stays looking good over the long term. Our ACM panels can also be used to create innovative geometric and natural forms that appear to defy gravity. Alongside this, our customers also benefit from our ability to manufacture a full range of complementary elements required on a modern rainscreen cladding system. These include window reveals, fascias, soffits, roofline and column casings. We also offer a wide range of materials and finishes to meet specific design requirements.